Up in the Lake District again for Christmas and probably New Year – the “probably” being that if the weather doesn’t improve London may have more appeal. I certainly don’t need reminding that the trip is about Christmas, but I’d arrived in one storm and another was forecast to follow, so I was despairing of getting any decent pictures. I don’t think it stopped raining on Sunday, only for a while on Monday, and it not at all on Christmas Eve, so the road to Keswick had one patch of flooding that made me turn back and take the long way round over the Honister Pass and down the Newlands Valley. Today the second storm arrived and the weather has been both atrocious and exhilarating as it proved John’s first law of landscape photography – when you wake up and can hear the weather outside, it’s probably not going to be your day. But Christmas Day itself was dry, and so was much of yesterday when I took this picture. Calling it Christmas in the Lake(s) is unusual for me – I don’t like naming pictures. Clever titles may well amuse, or convey some profound meaning or ironic twist, yet don’t they readily appear corny or trite? Even worse, in my opinion, is how a title provides the viewer with an explanation or interpretation. Surely they should be left to develop their own understanding and interpretation of the photograph. 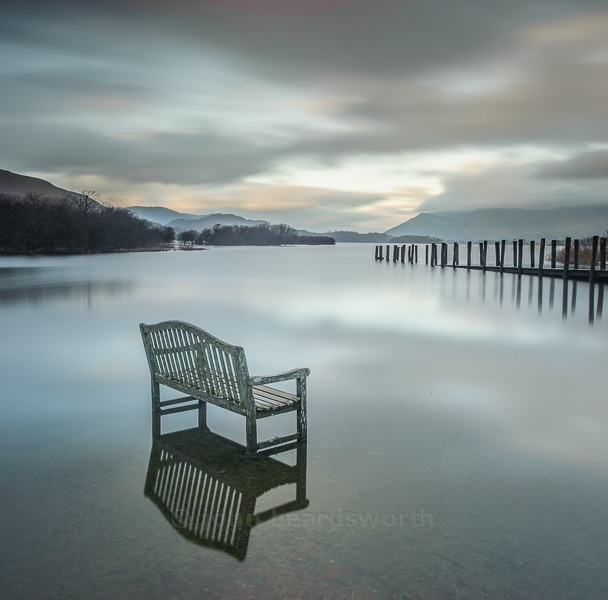 So this picture would normally be named Derwentwater or something similarly po-faced. If I wanted to be truly pretentious I’d perhaps add some Roman numerals and call it Lodore Study II. But Christmas in the Lake(s) seems to fit this one – interpret that how you will! While thinking names, “Seriously Bad Elf” must win John’s award for the best seasonal ale this year. And 9% too. It would be too rude not to try it, don’t you think? Happy Christmas!